for the debut of the new iconAclass album, Changing Culture with Revolvers. 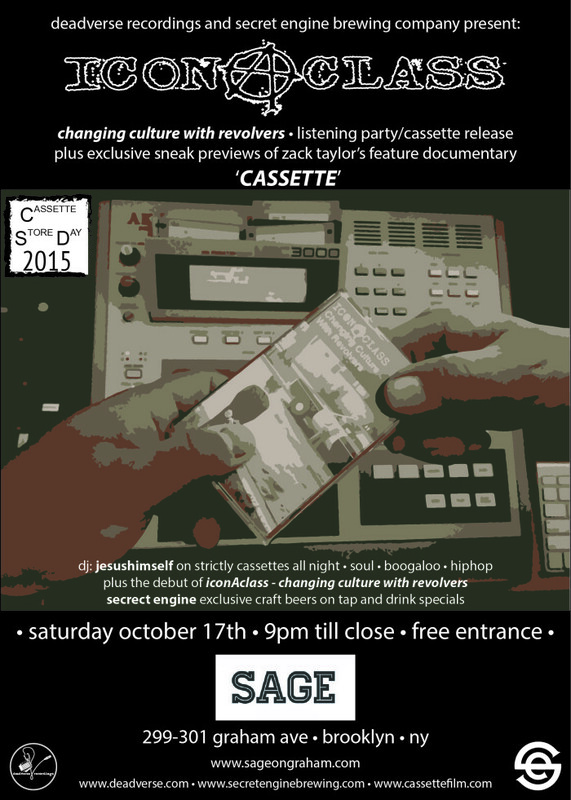 Plus Exclusive sneak previews of Zack Taylor’s feature documentary ‘CASSETTE’ playing throughout the night! Brooklyn’s own Secret Engine will be have 3 exclusive craft beers on tap for this event and drink specials! Enjoy SAGE‘s delicious Thai Cuisine. DJ: JesusHimself will be playing strictly cassettes all night long. Playing an ill blend of Soul, Boogaloo, and Hip Hop! Come have some drinks with iconAclass (dälek, Dev-One, & MixMaster Motiv) along with other deadverse members, as well as filmmaker, Zack Taylor, and the Secret Engine Brewing Company! Be among the first to listen to the new album Changing Culture with Revolvers. Best of all, its FREE to get in!!! Deadverse Recordings is releasing a limited edition [200 copies only] cassette (1st 100 Red tape copies are hand numbered and signed, to be followed by 100 copies of a blue tape, numbered not signed) for Cassette Store Day. There will be NO DIGITAL version of this release for the time being. So if you want to hear this, dust off your tape decks and walkman’s !!! Straight Boom Bap Hip Hop produced by dälek (Will Brooks) and featuring his rhymes as well as deadverse massive and Labtek member, Dev-ONE !!! Ridiculous Cuts by Mixmaster Motiv! This event, this album, and this film are NOT to be missed! The limited edition cassettes and other deadverse merchandise will be available for sale at this event, and will be for sale Monday Oct 19th on deadverse.com !!! Remember, once these are gone they are gone. No more tapes will be pressed.